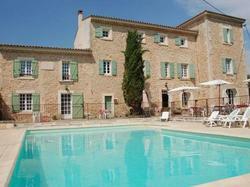 Relais de Roquefure is a 4-hectare property located in the Parc du Luberon in Provence. Its finely decorated rooms offers views of the park, swimming pool or les monts du Vaucluse. There is a restaurant in the Relais de Roquefure that serves regional cuisine made with local products. Dining is available inside or outside at the edge of the park. Parking is free at the Relais de Roquefure and Wi-Fi internet access is available in its public areas and is also free of charge. This small room can accommodate a maximum of 2 guests.